What's the difference between a "traditional" and a "lifestyle portrait?" Here's how I explain the difference: "Traditional portraits" capture what somebody looks like. "Lifestyle portraits" capture who they are! Sure, we all want pictures of our kids smiling at the camera. There's nothing wrong with a little 'cheese' every once in a while! But there's absolutely nothing more fun than a lifestyle portrait session and the photos of them truly being themselves are the ones you'll love the most when they're all grown up. So, how does it work? Basically, I hang out with you and your family at the park, at your home or any other location that we choose - wherever they're comfortable and happy - and I snap away! I let 'em run and play and even get a litte dirty! It's simple: We work hard to provide you with the absolute best product. We respect your time and investment, please respect ours. 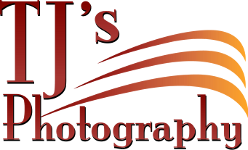 As a reminder, all portraits created by TJ's Photography are protected by Federal Copyright laws. It is illegal to copy or reproduce these portraits in any manner. If you want to display your portraits on Facebook, or other social media sites just say so! We will be happy to tag a few images for FREE where you can display them online. You just have to ask! Q) When do I get to see my pictures? For portrait sessions, you will see your images displayed on your online gallery within 2 weeks. For weddings it may take up to 3 weeks before your proofs are posted to the online gallery. Once you view the proofs you will be able to select your favorites and place your order via the shopping cart or simply by emailing or calling in to place it. Q) How can I get all of my proofs? In digital photography, there aren't any proofs in the traditional sense of the word. Your images come out of the camera and go right onto the computer. From there the images are processed from RAW files into finished portrait images. We don't actually print anything until you place your order. If you'd like to purchase the complete set of your images, we have options for you to do that. We offer a variety of beautiful Storybook Memory Albums and porfolios. Q) When do I pay for my session and portrait order? Session Fees need to be paid when you schedule your session. Portrait orders must be paid in full when you order your pictures (at your projection appointment). Please expect approximately 4-6 weeks before we call you to come get your order. We accept cash, check, and credit cards. For Groups: Solid colored long sleeved shirts in neutral tones (black, tans, white, cream) work best. We want to focus on expressions rather than the clothing, so please stay away from bright colors or patterns. Families should coordinate colors so that everyone blends together as a group. Reds should be avoided for group portraits. Seniors: Wear whatever you WANT too! Lots of variety in your outfits is best! Q) How do I book my session? Just call 248-884-8180 or send us an EMAIL All sessions need to be paid at the time of booking. Please note that we have a limited number of sessions available during our busy season (April - December) so call early to reserve your date and time. Payment via credit card is preferred to secure your session time. However, if you prefer to pay in cash, you will need to stop into the studio to book your session time and make your payment. Q) Do you offer any referral incentives? As a small business, my success depends entirely upon your satisfaction and word-of-mouth advertising. My hope is that you will pass on my information to your friends and family. As an incentive, for each referral booked, you will receive 1 complimentary 5x7 print from your next session. You may keep collecting these 5x7 cards and use as many as you've earned at your next portrait session. Seniors - ask for some special "referral cards" to give out to your friends to help you earn free wallets for your referrals!